Hi friends! Today’s sweet recipe is one that I created to benefit Organics for Orphans, an amazing non-profit organization that “empowers the poorest communities through organic gardening as well nutritional and natural medicine education.” I first heard of this organization back in the fall when Meghan Telpner’s Fall Culinary Nutrition Experts created a “pay what you can” charity cookbook for O4O.They raised over $5000 in a few short days through this initiative and so when Meghan and team sent out the call for recipes for the next cookbook I jumped at the chance. The theme for this cookbook is all things Moringa and every recipe needed to incorporate this food in some way. If you’re anything like I was when I first registered you’re likely asking “what the heck is moringa?” or maybe you’ve seen it in the wellness section of your health food store but never really knew what it was or why it is such a great food to incorporate into your diet. It’s one of the most nutrient-rich plant foods you can incorporate into your diet offering a broad spectrum of vitamins, minerals, essential amino acids, omega 3 and 6 fatty acids, antioxidants, and anti-inflammatory compounds. Phew! No wonder they wanted to focus on this amazing plant for their cookbook! It has been used in traditional cultures for centuries as a tonic, medicine, and strength-building food and is one of the medicinal herbs used in Ayurvedic medicine. Scientific studies are proving the what traditional wisdom has long supported that this food offers an opportunity to help nourish and heal. Organics for Orphans believes that because it grows in over 80 different countries around the world, it offers a unique ability to help “combat malnutrition and disease in some of the world’s most impoverished countries.” You can check out the impressive scientific literature on this herb here. Needless to say, I was convinced and set out to create a delicious and nutritious recipe using the powdered moringa from Top Nutritionals. As you know, my motto is always “Go big or go home!” and so I set out to include as many nutrient rich goodies in this recipe as I could for a one-two punch of yumminess and nutrient density. Lemons help improve liver detoxification and are a pretty fab source of vitamin C, while garlic and shallots contain sulfur compounds to help support our liver function. Olive oil contains those heart-healthy monounsaturated fatty acids and a whole host of super powerful antioxidants to protect your heart and nourish your cells. Basil is one of my favourite herbs and provides anti-inflammatory, anti-bacterial, and DNA protecting benefits. Finally pumpkin seeds are a wonderful source of zinc, a mineral that boosts immunity and is required for building healthy skin and digestive systems. 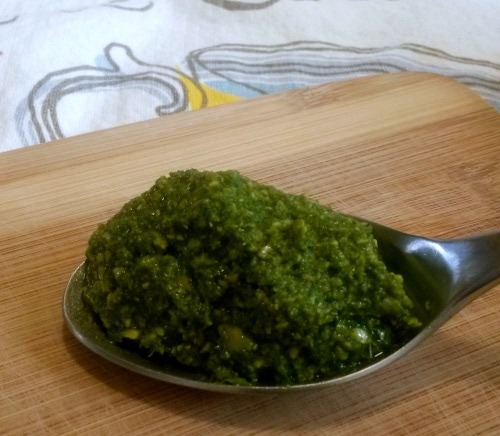 A pretty impressive array of health benefits from a humble little pesto! Let’s take a look at the goods. Add lemon zest and juice, olive oil, moringa, garlic, shallot, basil, parsley, and honey to a food processor or blender. Pulse or blend until just combined, with no large pieces or chunks. Add almonds (or seed of choice for a nut free option) to mixture and pulse until broken down but still chunky. Season with a pinch or two of sea salt and chill 3 hours. i. Cut zucchini in half widthwise. ii. Make 2 slices on either side lengthwise. i. Use a julienne peeler to shave zucchini into noodles. Toss noodles in desired portion of pesto, sprinkle with sunflower seeds and a drizzle of olive oil. Tastes great topped with a poached egg, goat cheese, and/or shaved asparagus. Bonus! Leftover pesto can be frozen in ice cube trays and then stored in an airtight glass container in the freezer for a quick and easy flavour-booster on those days when life gets hectic. It also tastes great on top of baked white fishes.